Since its preloaded with Ubuntu, every thing worked without much problem. Wifi autoconnects, display look good, all the laptop specific buttons work without any problem(did not check suspend/hibernate). So what’s my next step? Uninstall Ubuntu, of course. Don’t worry, I am not going to install Windows on it. No, I am not going for Fedora either(I use Fedora 8 on my desktop). I installed the latest version of Kubuntu – 8.10 or the ‘Intrepid Ibex’. As a matter of fact, I installed Xubuntu and then install the kubuntu-desktop package(I couldn’t get a Kubuntu CD). So now I have Kubuntu 8.10 with KDE 4.1. If my last experience with KDE4 has taught me anything, it is that KDE4 is nowhere near ready. Well, KDE 4.1 is much better – but still it has a long way to go before I am going to switch my desktop over to it. Anyway, I am going to continue using KDE 4.1 on the Lap. Hopefully they will release the stable release of 4.2 soon and I’ll upgrade to that. After I moved to Kubuntu there were a lot of ‘driver missing’ issues. Wifi stopped working. Some laptop LEDs stopped functioning. So I begun the driver hunt. The DVDs provided with the laptop had linux drivers in them – but they where RPMs – not DEB packages. I cannot understand why Dell did that either. If you preinstall ubuntu, provide the .deb packages. Before long, I stumbled upon an excellent tutorial on how to enable Atheros wireless. That got my Wifi up and running. The LED don’t work yet, but who cares. So what does this mean for you visitors? Expect some posts on Laptop specific topics as well as some on Ubuntu/Kubuntu. Earlier I only wrote about Fedora. You wouldn’t believe what happened to me with Kontact. My disk got full somehow. So, kontact refused to work. Anyways, when I removed few files to get free space, I found that all my email settings were gone, thankfully the mails were still there. And also, all my contacts were gone. Thankfully I had backed up everything from my gutsy + kde3.5 installation. I lost few contacts. 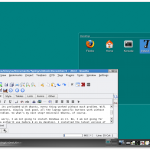 I seriously hate KDE guys for wasting time on just GUI, rather than stability issues. You need to be more specific than that. The Linux kernel, MS Windows, and KDE 3.x all have ‘lots of bugs’. KDE 4.2 does not suffer from this. For certain values of ‘fixed’. The concept of the Desktop has been changed. 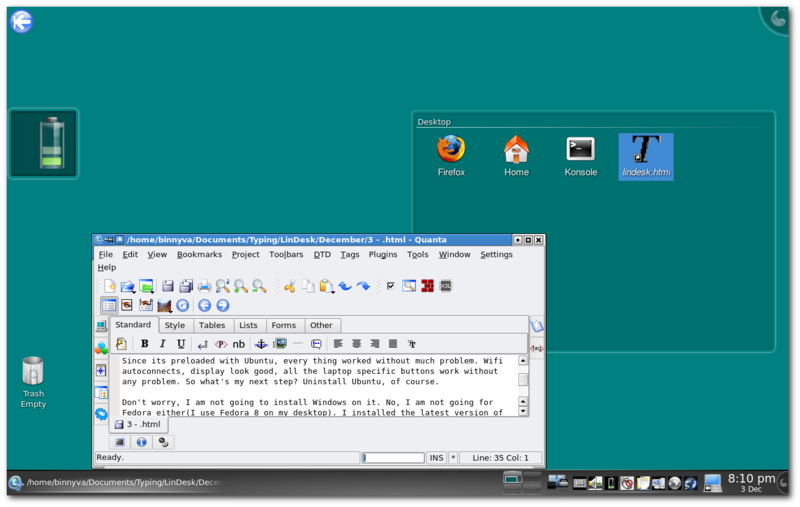 There is a Desktop Widget that functions as a traditional Desktop, though. Be specific about how it affects your workflow and I can better address the issue. Most of the bugs I found where already in the bugs.kde.org site(example). Just to be clear, this is not a rant against KDE – I love KDE. I just said that I’ll have to wait a bit more before KDE is stable enough for my desktop. Linux preloaded Dell is available in India? Since when? Do they by-chance charge you the OS ‘license’ fee even when you go for non-windoze pre-installed one? If yes/no, how do you check? Not sure since when – but I heard they were giving non Windows laptops earlier too(preinstalled with FreeDOS). From that to linux is not a huge jump. It cost around 33K rs. About the OS fee, I’m not sure – I asked them for one without windows pre-installed and thats what they gave me. I did not ask the price difference. I got this same model (with 1 GB added RAM), with Ubuntu preinstalled for 30500/-. I did knock off the carrrying case though. You can go to Dell India > Support Home Page > Product Support > Choose by Service Tag navigation and enter your service tag and get what was hardware and softwares came preinstalled from Dell, prior to shipping. I noticed that UBUNTU was preinstalled by Dell. hi sir i purchased Dell vostro A840 i installed RHEL5 but its not taking drivers of Ethernet, modem,Graphics, and all. Pls suggest me to do somthing needfull. Send me asap all Drivers of Dell vostro a840 and which operating system it supports.does it supports Windows XP. i have bought vostro A840 recently….do u think it is nice? i m a student, do u think i should have gone for an another model? hi.. sir i installed RHEL5.0 its working on it and all drivers are working very smoothley on it..
it before, but I will say it again: syrstay should be killed. Granted, it couldn’t REALLY be done right now, due to various legacy-systems that use syrstay. But it should be killed as far as KDE4-apps are concerned.It’s way too easy to pile icons in there. And while being able to hide icons helps out, it also makes it easier to keep on piling more and more icons in there.Right now there are loads of apps and services that put an icon in the syrstay without really thinking about whether that icon is really needed. End-result is syrstays that are brinmming with icons. And that multitude of icons means that the syrstay becomes less and less useful.IMO, syrstay should only display icons that are actively telling user something at that very moment. But even the we should ask: Why not use Knotify instead? Well, why not?For example: Various online-updaters distros use. Why do we have a syrstay-icons with bubbles that tell us when updates are available? Why not use Knotify instead? Why do we need to have an icon in the syrstay telling us “there are no updates available”? It’s madness, that’s what it is.I’d say that there’s nothing Systray provides that couldn’t be provided with the combination of plasmoids, Knotify and maybe Krunner. The sooner we kill the abomination that is the syrstay, the better off we will be.When there is a will, there is a way.